Brian Pounsett & his family reside in Christies Beach & have lived in the Southern suburbs since 1988. Married with four children, Brian is the third generation of a family heavily involved in the real estate industry since the early 1950's. Originally from the north eastern suburbs, after selling their family business, Brian & his wife decided to raise their children near the coast. Brian has been a licensed salesman since 1991 & a licensed manager since 2008 & has been the recipient of many sales achievement awards in this state. 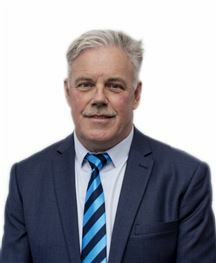 Brian has built a strong rapport with all his clients & attributes his success to hard work & a commitment to high standards within the industry. If you want personal service when selling your property, from an agent that really cares about you & your needs, contact Brian. Jayne is the Sales Manager of the Harcourts Christies Beach office and is very proud of her experienced team's results. She herself has had over 20 years of real estate experience in the Southern suburbs and with true dedication she has achieved scores of Sales Awards and 100's of testimonials from past clients. Jayne's passion for negotiation along with her honesty, hard work and friendly approach has resulted in a great deal of repeat business and many referrals from past clients. Susan takes the art of selling Real Estate to a new professional level, making your next real estate transaction positive and rewarding. One meeting with Susan and her skill and dedication is immediately clear. She is driven to succeed, is patient, perceptive, understanding and has a razor sharp focus for creating first class service. Susan see's herself as a problem solver, eager to listen, share knowledge and works tirelessly to achieve the goals of her clients. With her 20 plus years experience in the building and real estate industries and a background in sales, marketing and public relations, Susan is a professional with integrity and proven performances achieving many awards. Susan lives locally with her husband and 4 adult children and her knowledge as a local resident allows her to promote the genuine benefits of living in the south to potential purchasers. Throughout her career she has managed to build a strong and credible reputation with commitment to achieving superior customer service and excellent results for her clients. David has lived in the southern suburbs for over 20 years and has worked in Banking, Finance, property sales and settlements since 1989, his knowledge of the market, financial services and settlement procedures has allowed him to successfully negotiate sales and guide buyers and sellers through all facets of the sales and purchase process. His commitment to providing quality service, ability to think outside the square and his passion for selling homes means that you are in good hands, whether you are thinking of buying or selling David would be happy to help with all of your real estate needs. Under Contract by Susan Rule!! Morphett Vale, 79 Erebus Cct. Under Contract! by Susan Rule!